Bunker Hill Monument - A 221-foot obelisk stands atop Breed's Hill to commemorate the famous battle between American and British forces in 1775. Climb the spiral stairs to the observatory. Copp's Hill Burying Ground - An ancient cemetery located near the Old North Church. Cotton Mather, Robert Newman, and Prince Hall are some of the famous people buried here. Faneuil Hall - Before the Revolution, James Otis and many Patriots gave fervent speeches withn the hall of this building, giving it the nickname The Cradle of Liberty. Granary Burying Ground - The final resting place for many Patriots including John Hancock, Samuel Adams, James Otis, and Paul Revere. Notable colonial era symbolism is carved into the markers. King's Chapel - Colonial Governors worshipped in this church, also known as Stone Chapel after the Revolution. Reverend John Cotton and Puritan John Winthrop rest in the adjacent cemetery. Old North Church - From this steeple two signal lanterns were waved to warn the countryside that British forces were departing Boston for Concord. Paul Revere made his Midnight Ride that night. Old South Meeting House - Citizens and Sons of Liberty met in this church before the Revolution. Disguised Mohawks rushed passed here to Griffin's Wharf on their way to the Boston Tea Party. Old State House - The seat of government for Massachusetts during colonial times. A gold lion and unicorn rest atop its east wall. 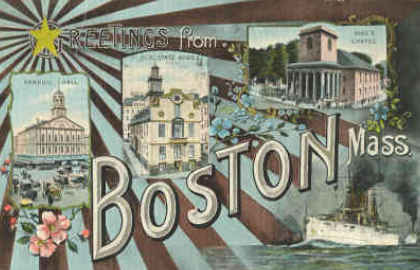 Today it is a museum operated by the Bostonian Society. Park Street Church - Fiery orations from the pulpit of this church helped to give Tremont and Park Streets the nickname Brimstone Corner. The society had sent many missions abroad during the 1800s. Paul Revere House - Built in 1680, it's the oldest building in Boston. A wooden structure with a notable overhanging second story. Patriot Paul Revere lived here during the 1770s. Shaw Memorial - A famous sculpture by Augustus St. Gaudens memorializes the brave acts of Robert Gould Shaw and the Massachusetts 54th Regiment. Their story is depicted in the 1989 film Glory. State House - This famous building was designed by architect Charles Bulfinch and has been the seat of government for the Commonwealth of Massachusetts since 1798. U.S.S. Constitution - This vessel is the oldest commissioned ship in the United States Navy, which earned the nickname Old Ironsides during the War of 1812.